Don’t miss out Hue when you visit Vietnam! Though lesser known than other cities in Vietnam such as Ho Chi Minh and Hanoi, Hue felt considerably more local and less modernized (read: homogenized). 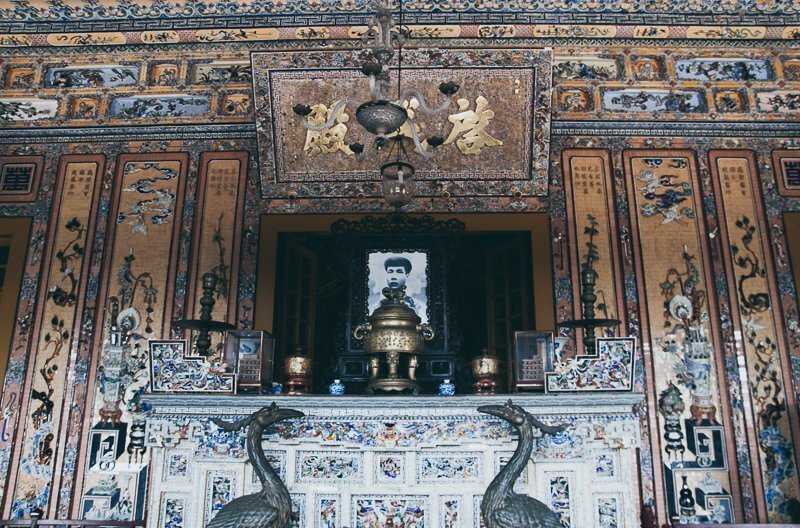 Here is part 2 of my day in Hue and if you missed out on part 1, click here. Khai Dinh was the emperor of Vietnam from 1916-1925 and visited France before his death; this could have explained the architectural influences of his tomb. 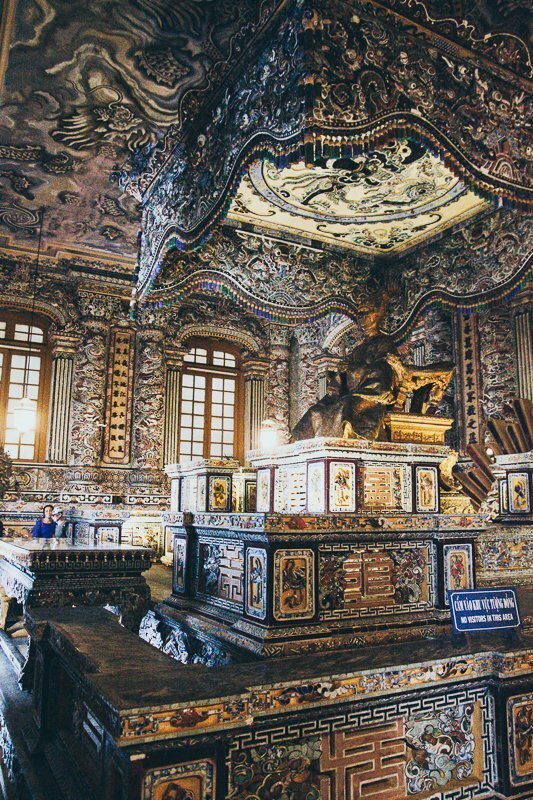 Despite being much smaller than other tombs, the tomb of Khai Dinh was perhaps the most elaborate and lavish. 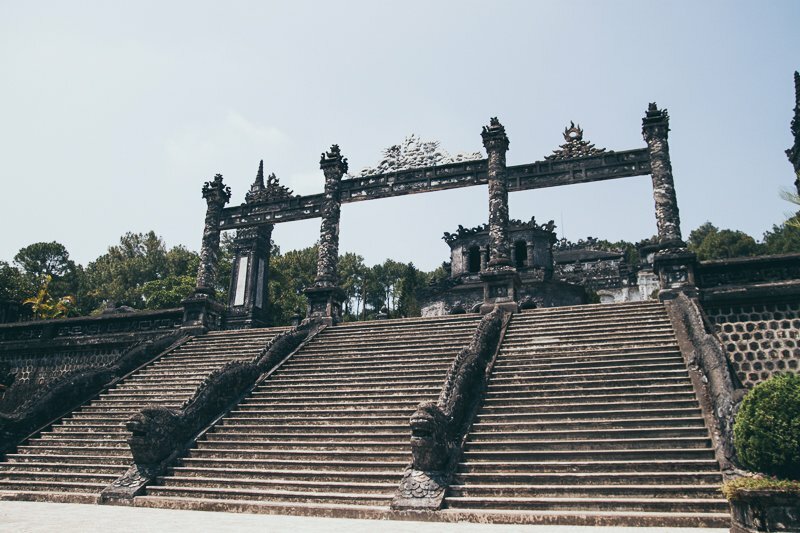 The exterior featured blackened concrete designed with a gothic touch and had steep steps up to the main hall (Thien Dinh palace) to create an imposing atmosphere. The interior was plastered with intricate mosaics in grandiose hues, a huge contrast from the outside. 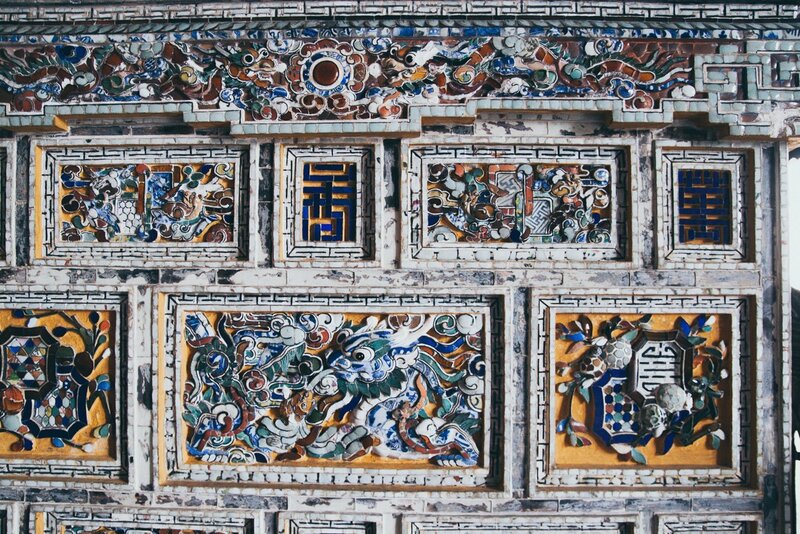 Bas-reliefs were pieced together in spectacular workmanship and artistry using the ceramic fragments, giving a sense of dimension and layers to the designs. And if you thought that was it, step deeper into the chamber and be prepared to be blown away by the extravagance. It felt like everything was gilded in gold and no surface was undecorated. This was such a huge contrast from Minh Mang Tomb, the previous tomb I visited. 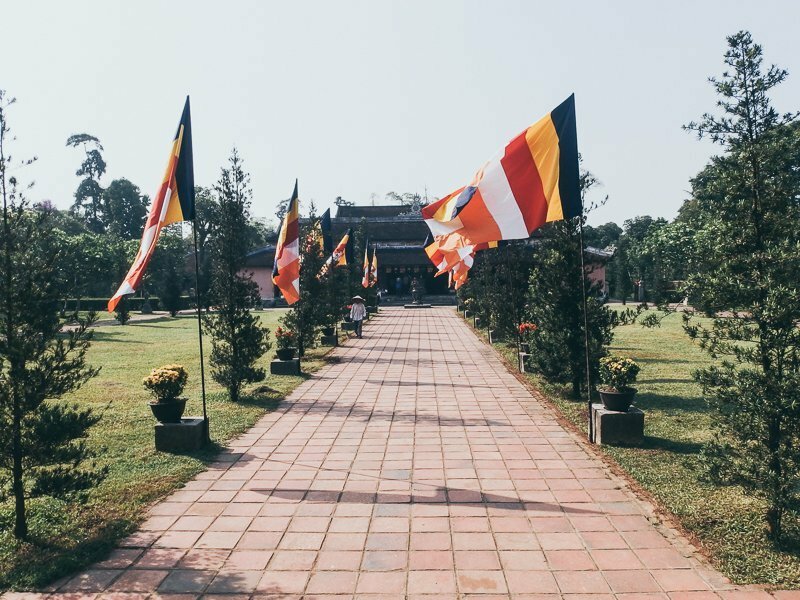 Stepping out of the palace, you will find yourself greeted with lush greenery which was refreshing after the almost psychedelic visual feast inside. Contradictions were aplenty in this tomb which made it all the more interesting. I definitely recommend this Tomb to visit, especially since it is only a 15 minutes drive away from Minh Mang tomb. 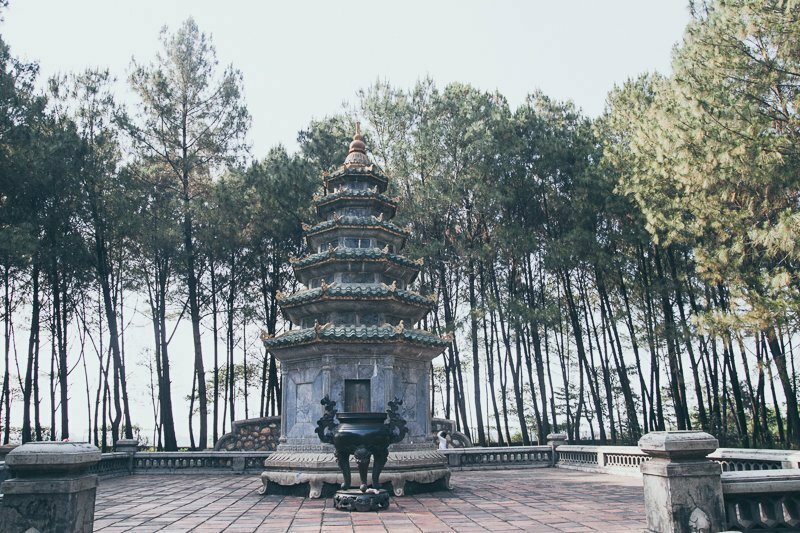 Thien Mu Pagoda (Pagoda of Heavenly Lady) is a temple complex along the Perfume River featuring a seven-storied Pagoda. 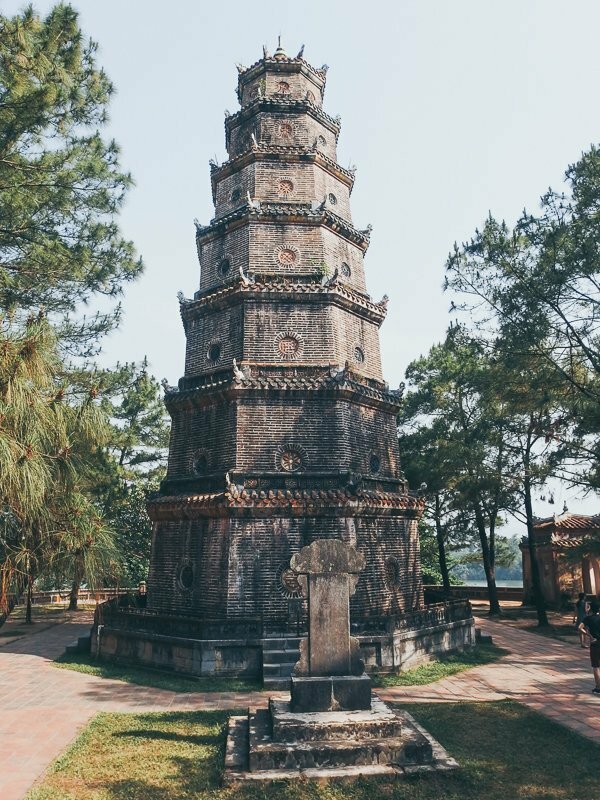 The Pagoda is also the tallest religious building in Vietnam. Go deeper into the temple grounds to reach the Dai Hung Palace. The religious sculptures will impress with its details and emotions. 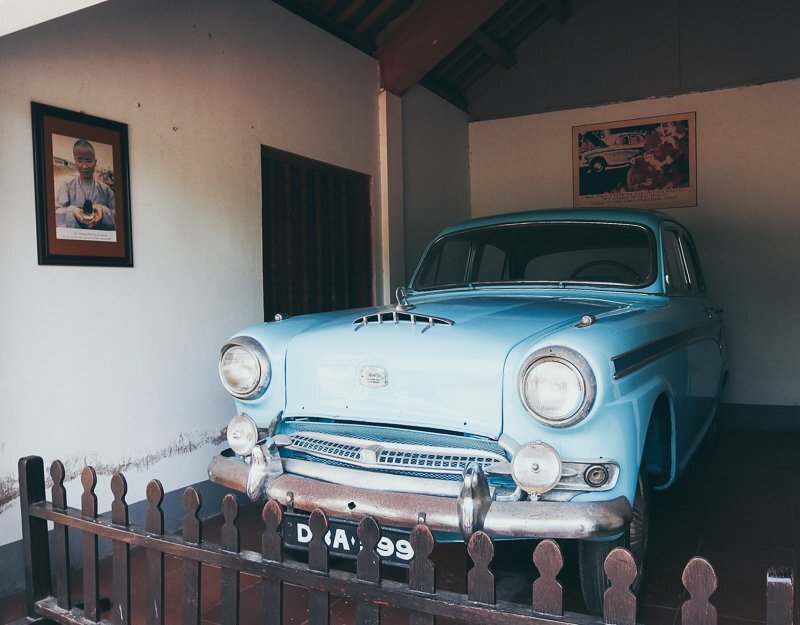 The temple also displays the car driven by the monk, Thich Quang Duc, to his self-immolation in Saigon to seek religious equality in a regime that favoured Catholicism and was oppressive towards Buddhism. There is also a small market outside the temple. Get a drink there to quench your thirst but I recommend shopping for your souvenirs in Dong Ba market instead (see below). Thien Mu Pagoda is right beside the iconic Perfume River (also known as Huong River). After visiting Thien Mu, walk along the river bank and try to get a boat back to the Citadel area. We managed to get on a boat quickly. I think the ladies on the boat were on the way back from their work. The boat was spartan and they got us plastic chairs to sit on. After some navigational mishaps, we finally found our way to Dong Ba market. 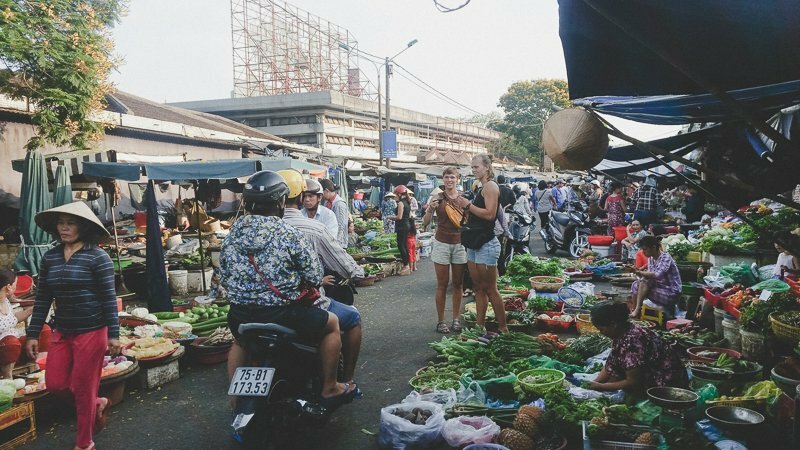 It is a market, so don’t expect it to be a shopping haven like Chatuchak in Bangkok. Instead, you will see stalls peddling vegetables, fresh produce, meats and condiments in most parts of the market. We took some time to explore the market and bought some souvenirs. Take some time to compare as there’s almost always a cheaper option in a different stall. You can have a meal in the market like we did. We randomly chose a stall and got seated at the low table. The ladies manning the stall were extremely hospitable and perhaps because they knew that we didn’t speak Vietnamese, they replaced their words with generous smiles. 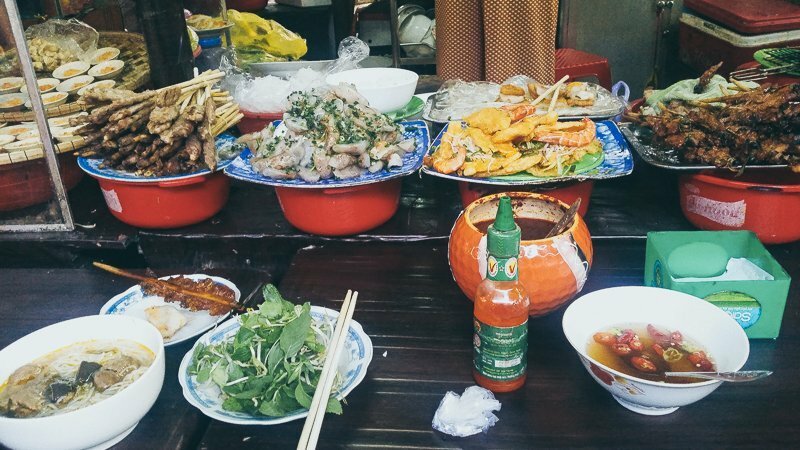 Our original intention was to try the popular Bun Bo Hue but the ladies kept piling food on our plates. We had to keep our guards up for additions. The Bun Bo was tasty, as with the other side dishes that we got. Unfortunately, we didn’t quite know what we were eating. 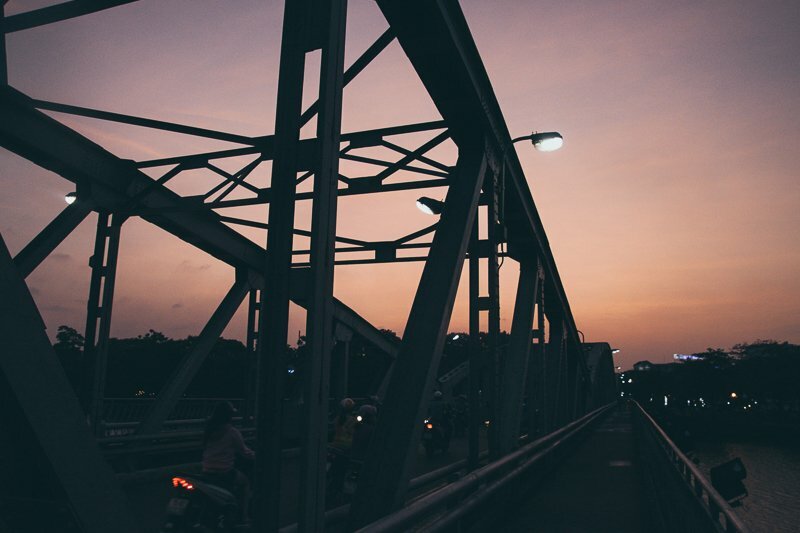 We were lucky to catch the tail of sunset when crossing the Truong Tien Bridge. The bridge was an iconic structure in Hue and was designed and built by the Eiffel of France (who also created Eiffel Tower). Something I only realized when I wrote this post. The bridge overlooked Perfume River and had three sections; middle one for vehicles while pedestrians could walk on either sides. After a breezy but humid walk, we strolled around to look for a comfortable place to rest and get some snacks. 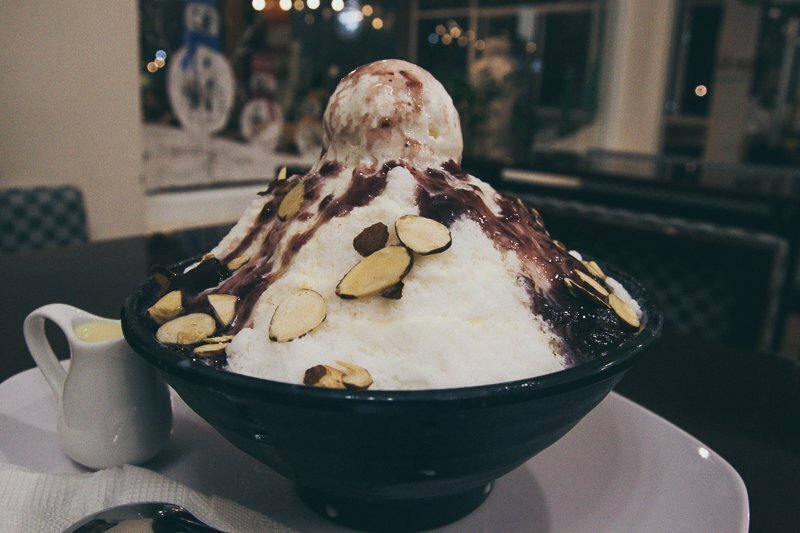 There was this stretch with relatively modern and air-conditioned shops so we popped into a Bingsu joint to grab some of the Korean dessert while we researched for our dinner/supper place. Relying heavily on TripAdvisor, we settled for Hanh (after failing to locate one or two restaurants).  The restaurant was bustling so we did a takeaway. Unfortunately, we had limited funds and could only do one dish. 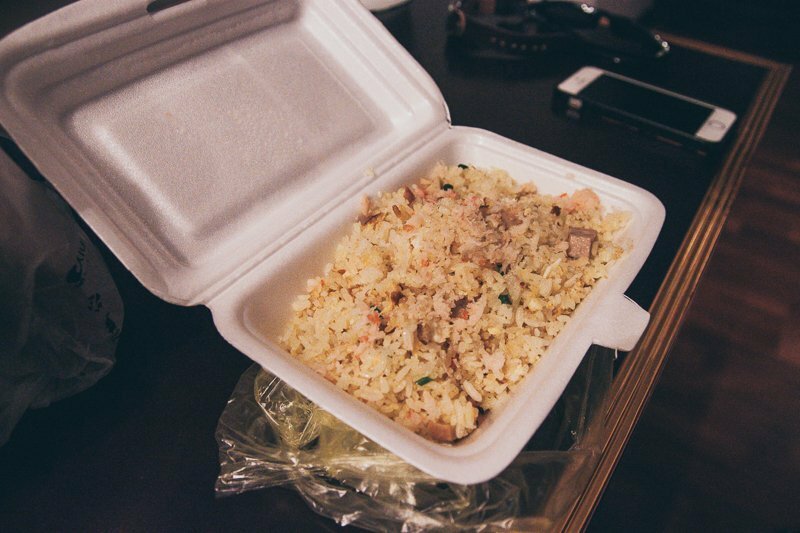 Even though almost every other table in Hanh ordered a Banh Beo, I persuaded my friend to go with a safe choice of com chien (a Vietnamese fried rice dish). 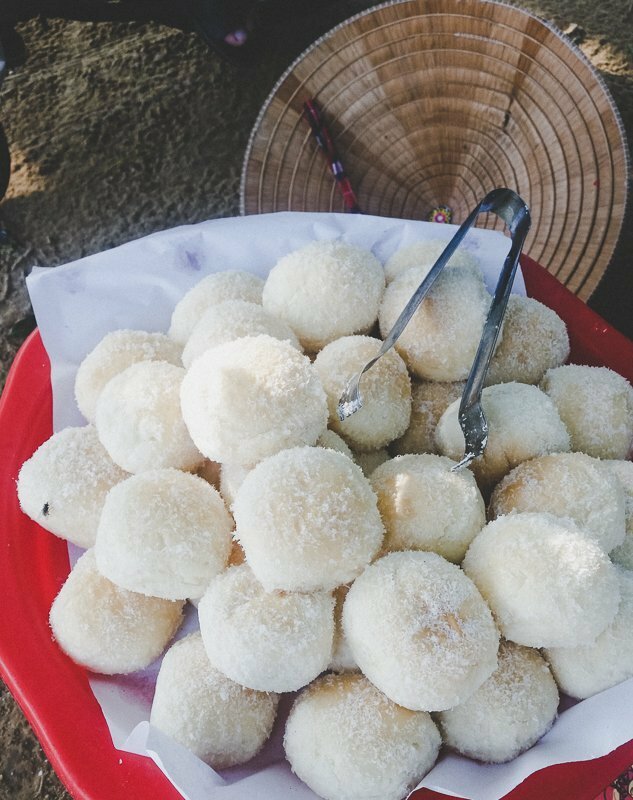 Looking back I could only say that I regretted deeply for not trying Banh Beo, which was a Hue signature dish made up of steamed rice cakes topped with shrimps, fish sauce and chilli. 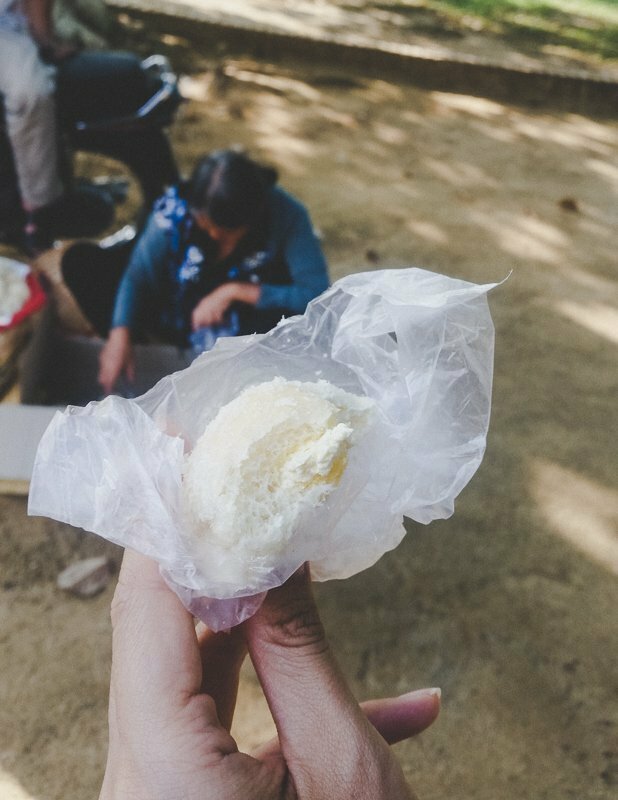 I only saw Banh Beo once outside of Hue so be sure to try it while you are there! Would I recommend Hue? Yes, totally! Hue maintains its local flavour with a dash of modernity. It was delightful to explore, more so than the other Vietnamese cities I was about to tour. Moreover, it was amazingly easy to feel the authenticity of their culture and local habits. 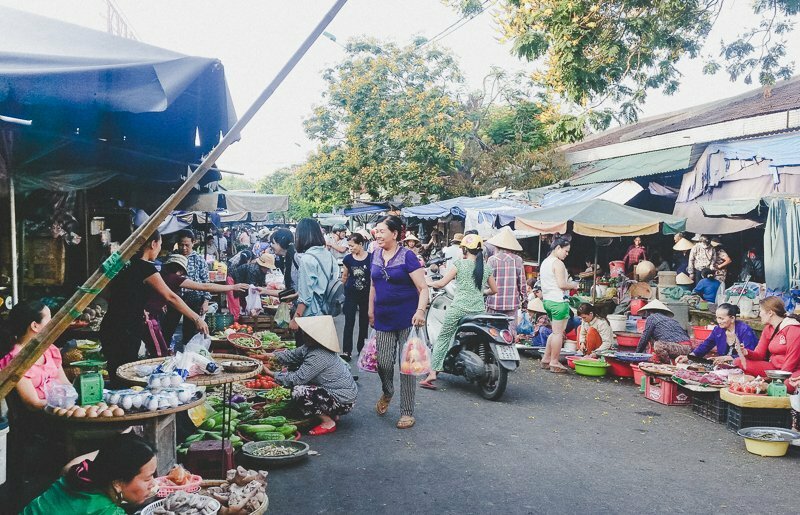 Amongst other things, just take a stroll down their streets, try a meal in their markets amidst the locals, or take one of the boats (not those tour cruises) down Perfume River.